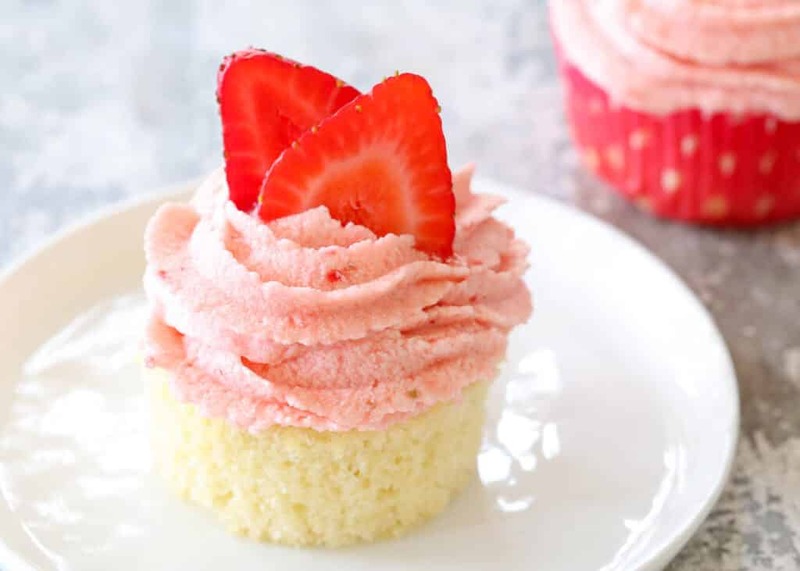 Fresh strawberries are one of my favorite fruits and this frosting is absolutely bursting with strawberry flavor. 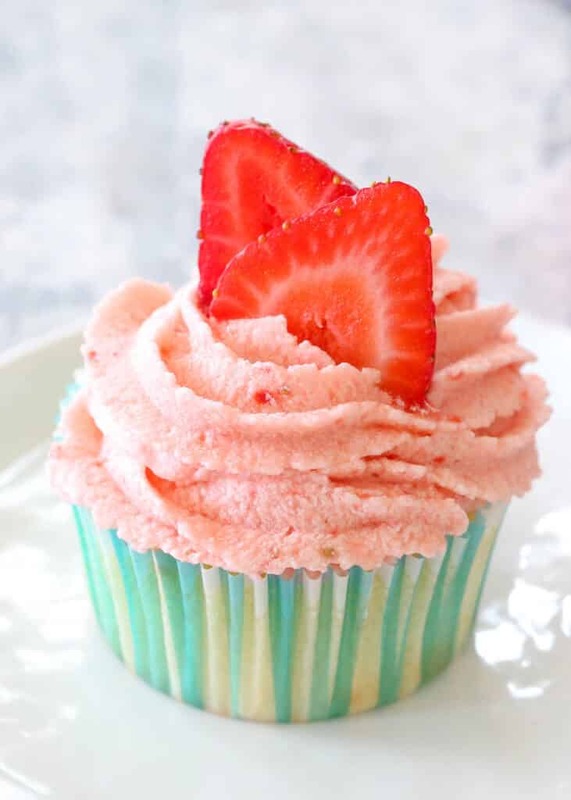 I crammed almost a full pound of fresh berries into this Fresh Strawberry Frosting and you can taste the berries in every bite. Sweet, but not too sweet, and versatile for all sorts of cakes and decorating purposes. The frosting thickens nicely for a pipable frosting and it thins out beautifully for a strawberry icing that can be poured over a cake. When the baby of the family turns four, it’s a pretty big deal. And when his cousin turns five and chooses to share a birthday party with him, it’s an even bigger deal. The cake requested was “super-extra-strawberry-cake-with-lots-of-strawberries-on-top.” If you say it fast enough and with enough excitement, you just might grasp how excited he was to choose his cake this year. Edited to add: We’ve been making this frosting for every possible occasion for several years now. 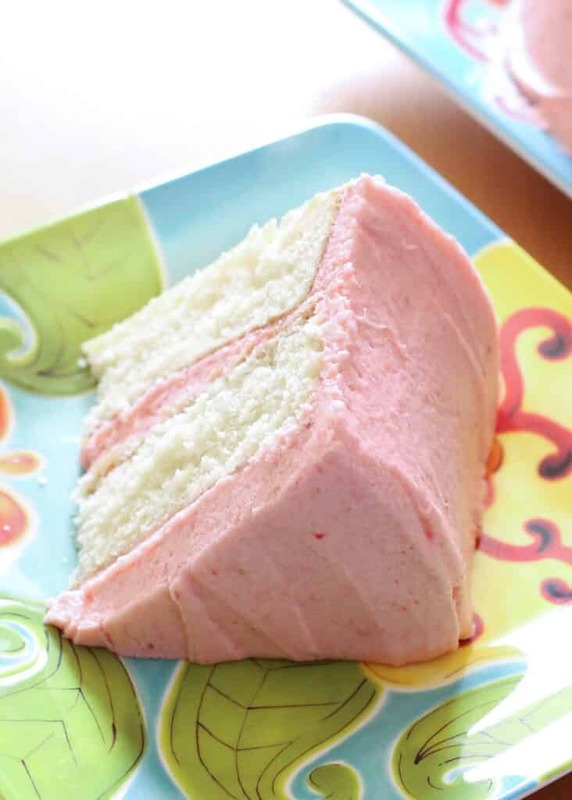 “Cake with the strawberry frosting” is the special request for most birthdays and no one can resist a spoonful of this Fresh Strawberry Frosting when we make it. My youngest son helped me make a batch last week and we shot the above and below videos to share with you. The frosting is so easy to make, it just might be your new favorite in record time. For a laugh, scroll down to the bottom of the post and watch the outtake clip from behind the scenes in our kitchen yesterday. There’s nothing funnier than a 7-year-old’s opinion on cake decorating. PLEASE NOTE: The directions for this recipe will make more berry puree than you will need in order to make this frosting. I haven’t found any way around this, simply because it requires a minimum amount of berries in order for the blender to puree them. Do NOT dump all of the puree into the butter/sugar mixture or you will have a soupy mixture on your hands. I save the leftover berry puree and add it to smoothies or stir it into oatmeal. You can also freeze the pureed berries in an ice cube tray and toss the cubes in a ziploc bag in the freezer until you are ready to use them. Kitchen Tip: I used these cupcake liners, this piping tip, and this mixer in the video for this recipe. Place 1 1/2 cups worth of the berries in the blender or food processor and puree until smooth, stop to scrape the sides as needed. This should only take a minute or two. Place the butter in a large mixing bowl and beat until smooth and creamy, add 1 cup of powdered sugar and beat again. Add 1 more cup of powdered sugar and beat to combine. SLOWLY add just 1/2 cup of strawberry puree (you will NOT use all of the berry puree) and beat again until smooth. Add the remaining powdered sugar and vanilla and beat until smooth and fluffy. 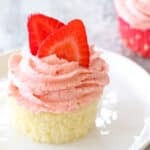 Add more strawberry puree ONLY as desired, for a creamier or pourable icing (the softer icing will only work for a sheet cake, it will need to be as described above for a layered cake) or add additional powdered sugar, for a thicker and more pipe-able frosting for decorating. Use the remaining berries to decorate the cake as desired. Store the decorated cake in the refrigerator until ready to serve. Enjoy! PLEASE NOTE: The directions for this recipe will make more berry puree than you will need in order to make this frosting. I haven't found any way around this, simply because it requires a minimum amount of berries in order for the blender to puree them. Do NOT dump all of the puree into the butter/sugar mixture or you will have a soupy mixture on your hands. « Spruce Up Spring Giveaway – 6 Winners – BIG Prizes!